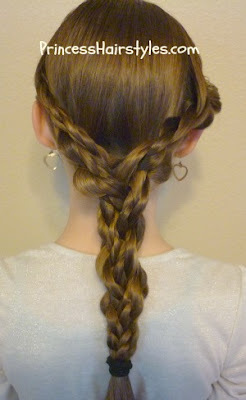 These cool braids which we are calling "magnet braids" are cute, super easy, and fun to make! Hope you enjoy our hairstyle tutorial this week. 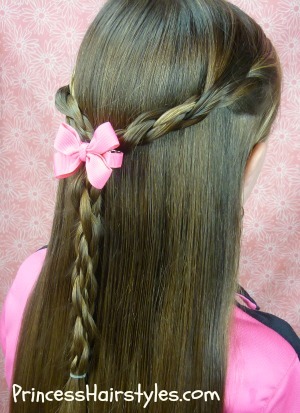 We love that this braid is quick and simple, but looks quite intricate and unique. I actually came upon this little trick by accident one day as I was making another hairstyle. Bonus! This "braid" requires no braiding skills at all..... just twisting! Many cute hairstyles can be made using this technique, including the 3 half up hair style ideas shown in our video tutorial below. The styles shown in our video will work best on medium to long hair. But, if your hair is on the shorter side, there are options for using this braid in other ways. We were able to make a single magnet braid hanging on the side in my niece's hair recently (which is only about shoulder length.) A little tip: Depending on the style you are doing, this braid will hold together better if you start with an elastic at the top. One more idea.... The Princess wore this twisted ponytail hairstyle to school the other day, and I actually remembered to take a picture! This style was started the same way as shown in our video above. After combining the 2 braids on the sides into one braid in the back, I made 2 more magnet braids with the remaining hair (one on each side of the middle braid) and braided the 3 braids together. Quick and simple! 2 winners, each receiving $50 through paypal. This contest is open to all of our YouTube subscribers (internationally.) Please click here to subscribe to Hair4MyPrincess if you haven't already. We will randomly select the winners from all of the comments under our video on YouTube on Sunday, March 3rd. The winners will be notified via private message on Youtube. We will also update here. Good luck! UPDATE: The 2 winners (chosen by random.org) are... YouTube users "J Shallow" and "maayanhillel" If you are one of the winners, look for a message from us in your YouTube inbox. I follow on facebook also. I am following on Pinterest and Facebook. Love seeing the new hairstyles. Congratulations on 50 million views, that is incredible!! You have been such an inspiration for my daughter and me, we have had so much fun since we discovered your blog 1.5 years ago; I think we will try the magnet braid tomorrow. I follow on facebook and Pintrest. I have just come across your site...and just in time as I was looking for some really good hairstyles for my 16yr old daughter. What you have put together here and on Pinterest is excellent. I can't wait to see what you do next.